Somewhere near the second birthday seemed to be the logical time to stop changing diapers. It was time for potty-training! After all, my first child woke up one day (after we had read a couple potty-subject books) at the age of 2 and said, “I need to use the bathroom” and that was it! It was a piece of cake! Obviously I had this motherhood thing accomplished, and I could teach anything! with me, because he wouldn’t sit long enough to hear anything. He would run around the room, while I read aloud, hoping that if I kept reading, one day he would be interested and look at a book. He did! When he was about 5. He never woke up and told me he needed to use the bathroom, so I started telling him. I got Skittles, lots of them. I set the timer for 20 minutes and walked him to the bathroom every 20 minutes. He just wasn’t getting it. But he preferred to go #1 in his pants. He taught himself the “flippy dive” (He named it too.) 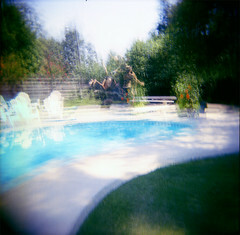 He would stand on the edge of the pool, and do a front flip into the water, giggling the whole way. (Yes, I said age 2!) Once, when we were staying at a hotel, a man thought I wasn’t watching and the heroic stranger almost jumped in after him, thinking he needed to be saved, since he was so small. The man was surprised. 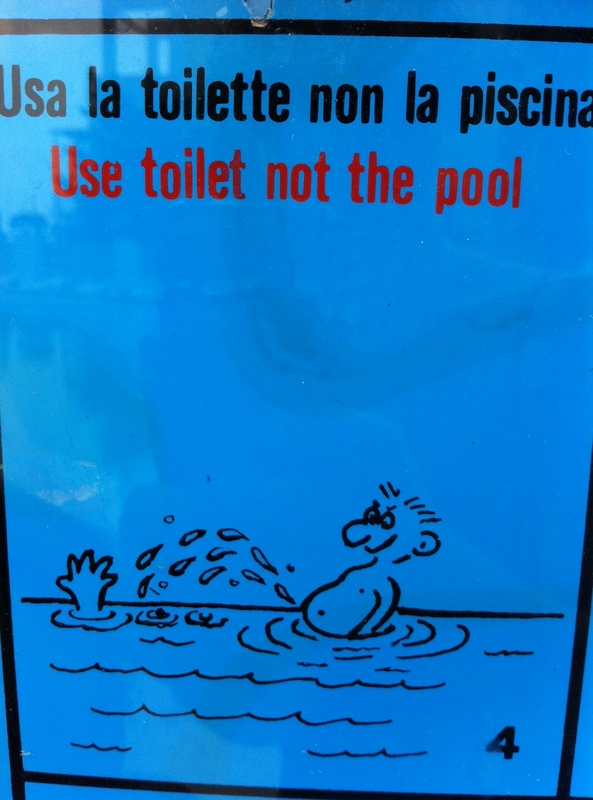 But the flippy-diver chose not to keep his pants dry. But he wouldn’t use the toilet. As he neared his fourth birthday, I had succumbed that the books were right. It had to be his choice, and I would never be able to change that…which was what made me think of “reverse psychology”. Moms can be creative! Suddenly he wanted to use the toilet. Done. No reward needed. He would come ask for Cheerios on his own, not to eat, but for target practice. He learned my methods of reverse psychology much faster than he learned potty training! But I could have given him ten gallons of ice cream with cherries on top – because I was elated he kept his pants dry for a day almost two years into the project!! Hang in there! I have never met a 16-yr-old who can do flippy dives, but not sink the cheerios. The light at the end is in sight; it might just be a long, wet tunnel. This entry was posted in Cute Kid Quotes, Motherhood, Tiny Tales of Toddlers and tagged Diaper, Mother, Parenting, potty training, Toilet training by Terri. Bookmark the permalink. Ha! I lived through this with you and you still make me laugh in this write-up! Well done! Terri, this could have not come at a better time! I have been working on this for a week now with my three year old nephew and nothing is working! Thanks for the encouragement! Great story! We’re a ways away from potty training but I love gathering tips and tricks – I’ll have to keep this one locked away! I’ve also heard that putting a sticker in the ‘target spot’ works too! Too Cute! With three in diapers for over a year, I sure could have used that trick. Cheerios sure are a mom’s best friend…from arts and crafts to high chair diversions, and now this! Terri, Thanks for the post:) My 22 month old is starting to get interested on how his big brother uses the potty. But when I ask if he wants to sit on the potty, he has only agreed once… and nothing happened:/. But he also jumps into a our pool, with a life jacket, pops up and swims back to the ladder. Rode on wave runner in the ocean full throttle & didn’t want it to end. Rides on four wheelers and cries to go faster. Jumps on the trampoline with his 3 older siblings & gets mad when they want to be done. Sooo I think he will definitely take the cheerio dunking challenge. And I’m sure his 7 yr old brother will gladly lead by example on this one for his little bro! There needs to book called “Personality Plus & Potty Training” because if you’re a mother of more then 1 child you know it’s different every time based on their personalities;). Love u, Jenny! WOW, this is too funny. Your patience is that of a saint. My kids are way past the potty-training stage, but it’s times you never forget! Thanks for sharing. Running a daycare for almost 40 years, and potty training my kids and grandkids has given me plenty of potty training stories, from a stay at home dad who hired me to train his daughter in one week, to my grand daughter who arrived at my house from Florida last year to see several little green potty chairs in the bathroom. Her comment was: Why does grandma Deb have all these doggy bowls in the bathroom? Where are the doggies? That was hilarious!! Thanks for sharing it! Our daughter is working on potty training our 3 1/2 year old granddaughter. She says her next project is the 1 1/2 year old. I just sigh and shake my head. I tried every trick in the book (and a few unwritten ones) with both our kids. Nothing doing. Neither was interested or motivated in the project, and you cannot make a child potty train who doesn’t want to, as I repeatedly tell our daughter . . . Enter preschool. Wearing diapers on the first day as 4 year olds (even as special needs ones) and realizing ALL the other kids were in underwear was more humiliation than either of my kids could bear. Daytime training was done in two weeks, and night time was done in 2 months, both times. One of my boys was showing off when he announced to his uncle, “Look, I can hit the corners of the wall!” Another, I found out was aiming for the air vents! 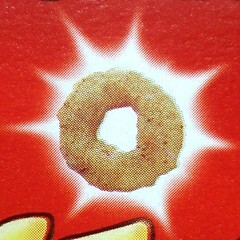 Why didn’t I know the cheerios trick? It would’ve been so much better! Great story. I remember trying to potty train my son, long time ago, very frustrating for months. He went to my sisters for a weekend and came back potty trained, I thought it was great that we did not have to deal with those diapers anymore. Everything he has done has been on his time & no one else’s, not always good as the mom, but he is a young man to be very proud of. thanks for the great stories. This one spoke right to my heart! My 26 month old sounds like he will be just like your youngest! He is so smart and can accomplish everything he tries! He has no interest in “trying” the potty! Thank you for sharing your story and the hope that it will happen! Wonderful, funny!! Can’t wait to meet this very talented young man. !!!!!! Thanks, Terri, for this! It takes me back to my potty training days (which, I am grateful, are over). My kids are now 15, 14 and 8, and I haven’t had to worry about it for years. But, I also haven’t thought about it for years. Thanks for the laughs! Hahaha! You are very funny, Terri! It must be a comedy show at your home sometimes with both you and Chris entertaining! This story reminds me of the bittersweet phrase “This too shall past.” I am reminded of this more often the past couples months as I have been trying to figure out the needs and temperament of my 2.5 month old baby. As I bounce, pat, walk, wear and dance her to sleep (rarely does anything that requires me to sit put her to sleep), I think “I cannot wait till falling asleep requires a little less effort on my part.” Immediately, however, I realize that with my self-soothing phrase “this too shall pass” ends the eye flutters, sweet noises and spontaneous smiles while sleeping, in addition to the indescribable preciousness of a content newborn baby. That brings back so many memories of our youngest. LOL I need to write them down. She likecrawling had no interest in walking. At about 10mos old her sister 25 mos we noticed toys out in the middle of the night. The older child was blamed because the 13 month old was in a crib, we explained you don’t get up and play when its dark to our older child. She being the big sister went along with it never told us any different. Well I work nights and I came home early one morning I find the 10 month out of the crib playing, to my amazement. Terri this is too funny! I have the same story going on at my house right now. The 3 year old swims like a champ but is not remotely interested in being potty trained. And like you, we have tried EVERYTHING. Extreme choleric-the only choleric in our house. 😳I anticipate many more stories from this 3 year old of mine.